With the largest and most comprehensive pipe and tubing extrusion capability in the world, Ashtapad Overseas offers the widest variety of materials and sizes for all of your applications. 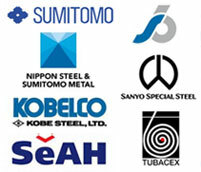 Ashtapad serves the Power Generation market with transfer pipe, boiler tube, main steam pipe, hot re-heat pipe, flue gas desulphurization units and other products for nuclear, coal-fired, renewable and combined cycle applications & for the oil and gas industry, we offer ASTM A789 Duplex stainless steel 2205 Seamless Pipe, seamless and welded pipe and tubing for a variety of applications including OCTG and mechanical tubing, co-extruded clad line pipe, umbilical and control lines, and process piping. Ashtapad offers a wide range of ASTM A789 Duplex stainless steel 2205 Seamless Pipe, 316 Seamless Tubing, 316 Seamless Pipe, ss 316l Seamless Pipe, 304 Seamless Tube, 304 Seamless Stainless Steel Tubing & Hydraulic Tube etc. We can meet most ASME, ASTM, AMS, and military specifications, and can cross-reference to most international standards, including full DIN 3.1b, full 3.1/3.2 Certifcation and NACE requirements. Looking for a ASTM A789 Duplex stainless steel 2205 Seamless Pipe supplier that offers quality products with fast turn around times at competitive prices? If so, you’ve come to the right place. Our products, including Nickel 600 and Alloys 625, 718, seamless stainless steel and X750 are stored and pulled directly from warehouses. 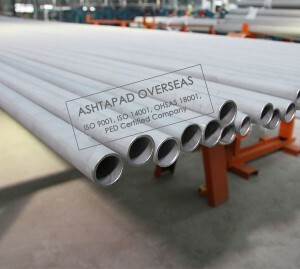 We stock and sell ASTM A789 Duplex stainless steel 2205 Seamless Pipe, this alloy is also available in form of Flat Bar, Forging Stock, Hexagon, Plate, Round Bar, Sheet, Strip and Wire. All the alloys are high temperature/corrosion resistant alloys that are often used in the aerospace industry. We have more than 1200 tons of ASTM A789 Duplex stainless steel 2205 Seamless Pipe in ready stock for immediate dispatch in our stockyard. Also we provide value addition to the client in the form of cut to length size, slitting, shaping, and fabrication, superior finishing, marking, beveled end, specialized cap protection. The seamless steel pipe manufacturing process starts with a solid, round steel billet. This billet is then heated to great temperatures and stretched and pulled over a form until it takes the shape of a hollow tube. As other steel pipe suppliers will tell you, there are three great advantages to making a pipe in this way. A seamless stainless steel pipe or tube can pass through as many as 100 production steps before taking its final form and quality. The main perceived advantage of seamless pipes is that they don’t have a weld seam. Traditionally, the seam of welded pipes has been viewed as a weak spot, vulnerable to failure and corrosion. For many years, this fear was probably justified. However, in recent years improvements in the manufacturing process for welded steel pipes and other welded pipes have boosted the strength and performance of the weld seam to levels indistinguishable from that of the rest of the pipe. Seamless pipes have better ovality, or roundness, than welded pipes. The advantage of a duplex structure is that it combines the favorable qualities of a ferritic alloy (stress corrosion cracking resistance and high strength) with those of an austenitic alloy (ease of fabrication and corrosion resistance). Usage of 2205 Duplex stainless steel should be limited to temperatures below 600° F. Extended elevated temperature exposure can embrittle 2205 stainless. 2205 duplex stainless steel is a cost effective solution for many applications where the 300 series stainless steels are susceptible to chloride stress corrosion cracking. Stress corrosion cracking occurs when stainless steels are subjected to tensile stress, while in contact with solutions containing chlorides. Increasing temperatures also increase the susceptibility of stainless steels to stress corrosion cracking. The combination of chromium, molybdenum and nitrogen convey the good resistance of 2205 to chloride pitting and crevice corrosion. This resistance is extremely important for services such as marine environments, brackish water, bleaching operations, closed loop water systems and some food processing applications. The high chromium, molybdenum and nitrogen contents of 2205 provide corrosion resistance superior to common stainless steels, such as, 316L and 317L in most environments. Most Duplex 2205 producers recommend a maximum hot forming temperature between 2010 and 2100°F (1100 to 1150°C). If the shape of the work piece is not compact, the edges may be significantly cooler than the bulk, and there is risk of cracking in the cooler regions. Duplex 2205 has shown good formability in a variety of fabrications. The high strength of Duplex 2205 can pose problems. Even when the equipment has sufficient power, allowance must be made for higher spring-back caused by the grade’s high strength. Duplex 2205 is somewhat more difficult to machine than the 300 series austenitic stainless steels. Higher cutting forces are required and more rapid tool wear is typical. Some guidelines for machining are: A) Use powerful, rigid machines with extremely strong rigid mounting of tools and work piece, B) Minimize vibration by keeping the tool extension as short as possible, C) Use a nose radius on the tool, no longer than necessary, for carbides that have a sharp edge while still providing adequate strength, D) Design machining sequences to always provide for a depth of cut below the work hardened layer resulting from the previous passes. 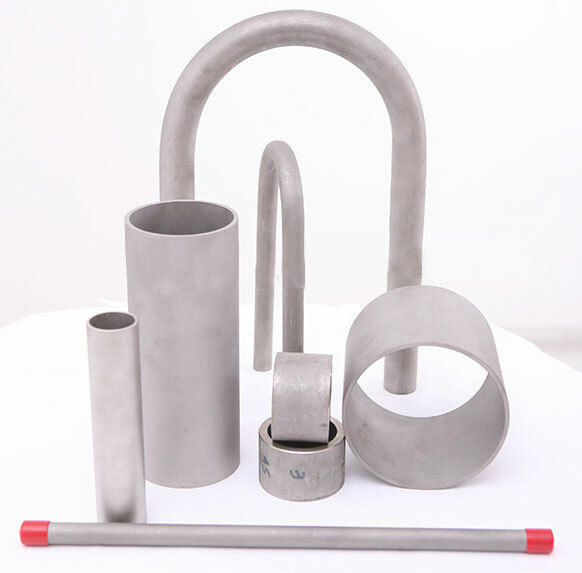 Tags: ASTM A789 Duplex stainless steel 2205 Seamless Pipe, best quality ASTM A789 Duplex stainless steel 2205 Seamless Pipe, wide variety of ASTM A789 Duplex stainless steel 2205 Seamless Pipe, ASTM A789 Duplex stainless steel 2205 Seamless Pipe India, ASTM A789 Duplex stainless steel 2205 Seamless Pipe distributor Mumbai, ASTM A789 Duplex stainless steel 2205 Seamless Pipe traders, prime quality ASTM A789 Duplex stainless steel 2205 Seamless Pipe, ASTM A789 Duplex stainless steel 2205 Seamless Pipe exporter, Source for ASTM A789 Duplex stainless steel 2205 Seamless Pipe, specialize in ASTM A789 Duplex stainless steel 2205 Seamless Pipe, ASTM A789 Duplex stainless steel 2205 Seamless Pipe with Test Certificate, ASTM A789 Duplex stainless steel 2205 Seamless Pipe manufacturers, ASTM A789 Duplex stainless steel 2205 Seamless Pipe manufacturer & suppliers, ASTM A789 Duplex stainless steel 2205 Seamless Pipe importer, ASTM A789 Duplex stainless steel 2205 Seamless Pipe exporter, ASTM A789 Duplex stainless steel 2205 Seamless Pipe dealers, ASTM A789 Duplex stainless steel 2205 Seamless Pipe mill, ASTM A789 Duplex stainless steel 2205 Seamless Pipe price, ASTM A789 Duplex stainless steel 2205 Seamless Pipe ready stock, used ASTM A789 Duplex stainless steel 2205 Seamless Pipe, ASTM A789 Duplex stainless steel 2205 Seamless Pipe manufacturing process, Brand Steel Pipes stockist, send your ASTM A789 Duplex stainless steel 2205 Seamless Pipe requirement to our Mumbai, India office by email ashtapad@vsnl.net, ISO 9001, ISO 14001, OHSAS 18001 certified & Government Recognized Export House, Click here to send us your requirements of ASTM A789 Duplex stainless steel 2205 Seamless Pipe. 46+ tons in ready stock, order small (1 piece) or large quantity.